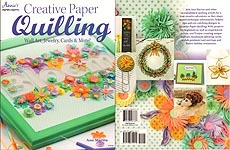 Creative Paper Quilling, designed by Ann Martin, Annie's, 2013, 2016. Projects in PAPER CRAFTING for beginners to experts include: CARDS -- Asian Inspiration, Pretty Flowers, New Little One, Birthday Train, Butterflies & Blossoms, Hearts Linked, Happy Birthday; JEWELRY -- Diamond FLower Pendant, Double Flower Pendant, Teardrop Earrings, SIlver & Gold Earrings, Alternate Side Loop Flower Pendant; ORNAMENTS -- Elegant Easter Ornaments, Holiday Wreath, Santa Ornament, Joyeux Noel Card & Ornament, Let It Snow, Halloween Bat; HOME & GIFTS -- Bloom, Pretty Page Markers, Floral Frenzy Message Board, Quilled Hedgehog, Wrought Iron Cross, Americana Sheep, Elegant Candle Sleeve. Brand New 2016 Release! 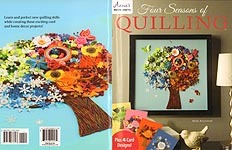 Four Seasons of Quilling, designed by Shelly Krzyzewski, Annie's, 2013, 2016. Projects in PAPER CRAFTING include: Four Seasons Tree Sampler, Spring Tree, Summer Tree, Autumn Tree, Winter Tree plus 4 card designs. Brand New 2015 Release! 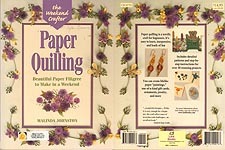 The Weekend Crafter: Paper Quilling, by Malinda Johnston, Lark Books, 1998. "Beautiful Paper Filigree to make in a weekend": Wreath and Gift Cards, Butterfly, Poppies and Daisies, Bouquet on a Woven Background, Fall Harvest Design, Quilled Border, Flared Border with Huskings, Gloriosa (or Flame) Lily, Teddy Bear, Spray of Flowers, Swans, Quilt Block Designs, Tiger Cub, Christmas Centerpiece, Earrings and Brooch, Hudson Model 20 (1910), Carolina Wren and Apple Blossom, Angels, White- On- White Wedding Border, Filigree Medallion, Irises. Former owner's name written on cover, former owner's address sticker on cover. Otherwise, very good used condition. 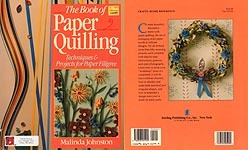 The Book of Paper Quilling, by Malinda Johnston, Sterling Publishers, 1995. "Techniques & Projects for Paper Filigree": Beginner's Floral Design, Berries (Blackberries, Strawberries, Raspberries), Kitchen Herbs (Tarragon, Rosemary, Dill), Sailboats, Grapevine Wreath, Bird Shalom, Flowers and Butterflies, Quilled Wreath, Chickadees, Bluebird in a Dogwood Tree, Old- Fashioned Garden, Cherry Blossoms, Christmas Tree and Wreath Designs, Christmas Sampler (Poinsettia With Holly Leaves, Candles, Bells, Tree, Joy, Wreath, Packages), Medallion Ornaments, Quilt Block Ornaments, Baby's First Christmas, Twisted- Loop Ornaments, Christmas Gift Tags, 3- D Ornaments, Snowflake Ornaments and Gift Tags, Santa Claus, 6 Elves, Shamrock Bouquet, Halloween Decoration, Valentine Hang Up Heart, Cross, Wuilling on Lace Eggs, Quilling on Satin Eggs, Border for a Wedding Announcement, Calla lily Border Design, Bridal Canopy Border Design, Floral Gift Tags, Gift Cards (Lily of the Valley, Orange Flowers, Swan), Gift Bags (Balloon, Bouquet, Fringed Flowers), Fridge Magnets, Quilling for Coasters, Quilling on Baskets, Woven Heart Border, Chess Board, Earrings, Oval Border, Quilled Flower Hat, Quilled Nosegay for a Bentwood Box, Border for a Quilling Verse, Floral Border for an Oval Frame, Free-standing Quilled Clown, Miniature Plants on Shelves (Airplane Plant, BLooming Bells, Hyacinths, Trailing Dedum, Long- Stemmed LIlies), Quilled Dinnerwear Miniatures (Plate,Saucer, Cup, Teapot, Creamer, Sugar Bowl, Covered Pedestal Bowl), Rose Bouquet, Carousel Horses, Bookmarks, Picture, Border for School Picture, Circus Clown. Former owner enjoyed this book -- written name and address sticker on cover, one page is pulled out (page is here, just separated from binding), notes on one page, small tear on one page. Some spine wear. 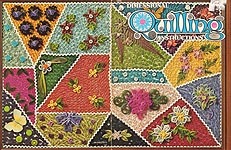 Decorative Quilling, by Maude Wallace, Craft Course Publishers, Inc., 1973. Quilling Primer; projects include: Winsome Willie the Owl, Wedding Invitation, Grape Cluster, Jeweled Tree, Custom Precision Frame, Filigree Valentine, Fantasy Fan, Oblong Frame Pattern, Corner Patterns, Posie Patterns, Oval Frame Pattern, alternative ideas for using designs. Tags, former owner's name/address stamps on covers; otherwise, good condition. 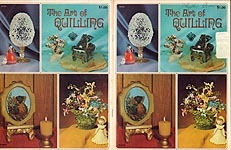 The Art of Quilling, by Carol Dreesen, Craft Course Publishers, Inc., 1974. Builds on techniques used in Decorative Quilling, above. Projects include: Flower Bower, Parasol, Filligree Egg, Quillarium, Blossom Tree, Grand Piano, Otis the Owl, Basket of Flowers, Wedding Bells, Oraments (Bell, Snowman), lots more ideas. Tags and former owner's name on cover, one dog-eared page; otherwise, very good used condition. Dimensional Quilling, by Betty Nelson, Harold Mangelsen & Sons, Inc., 1974. Projects include: Your Name in Quilling, Mums, Antique Doll, Daisy Bouquet, Mushrooms on Quilling, Iris, Watermelon, Crazy Patchwork Quilt, Dried Flowers Seashells and Quilling, Lilacs. Tag on cover, former owner's stamp on inside front cover, center page pulled away from bottom staple. Quilling, designed by Sally Mann, Harold Mangelsen & Sons, Inc., 1973. Projects include: Basic Instructions, Basic Rolls and Scrolls, Sampler Board, Key Keepers, Violets, Orange Slice, Sewing Girls, Poinsettias, Captured Quilling, Strawberry Time, Winged Beauty, Persian Mushrooms, Delphinium and Daisies, Frame a Photo, Quilled Candlelight, Mod Christmas Tree, Mortimer Mouse. Excellent condition. 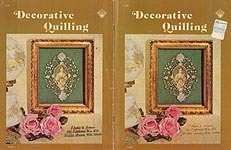 Quilling & Paper Filigree for All Ages, James E. Gick, 1974. Projects include: Owl, Grapes, Family Foto Frame, Floral Scroll, Wheat, Spring Bouquet, Sunflowers, Muchrooms, Whirl- a- Gigs, Christmas Tree & Bell, Mandala, Weeds 'n Seeds. Tags & former owner's stamp on front cover, spine wear. Pages in very good condition. 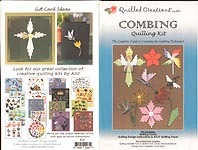 Combing Quilling, Designed by Alli, Quilled Creations, Inc., 2006. Self- published instruction packet ONLY from kit: Pin Wheels, Angel, Pink Flower, Cross, Flower, Black Eyed Susan, Bumblebee, Hummingbird, Butterfly, Star. Digest- size, very good condition. 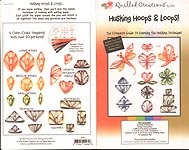 Husking Hoops & Loops, Designed by Alli, Quilled Creations, Inc., 2004. Self- published instruction packet ONLY from kit: "Complete guide to learning the Husking Technique." 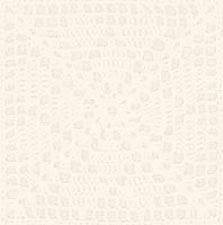 Patterns include Large Wings, Medium Wings, Small Wings, Triangles, Rectangles, Squares, Hearts, Hexagon, Circle. Digest- size, very good condition. 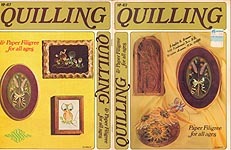 Practical Quilling, by Anne Redman, Kangaroo Press, 1998. Projects include: FOR THE BEGINNER -- Set of Gift Tags, Christmas Tags, Pot of Flowers; EASY FLORAL DESIGNS -- Lattice Roses, Jessica's Basket, Birthday Roses, Lavender, Heart of Roses, Happy Birthday Mum, Wild Iris, Bush Iris, Topiary Tree, The Flower- Watcher, 3-D Fuchsia, Fuchsias, A Blush of Pink, Heart and Flowers, Ikebana Bowl, Ikebana in Rectangualr Vase, Ikebana Roses; WILDFLOWERS OF THE WORLD -- Australian Wildflowers, A for Acacia, Wattle Wishes, Native Violets, Sculptured Sunflower, Red Clover, Spider Lily, Forget- Me- Not, Scotch Ghistle, Bluebells, Buttercup, Waratah; ANIMALS AND BIRDS - Swan Song, Parrot, Robin's Choir, Centipede, Leaping Dolphins, Dolphin, Green Tree Frog, Dog, Cat Gift Tag, Dreamtime Lizard; WEDDINGS & ANNIVERSARIES -- Silver Anniversary, With This Ring, Wedding Flowers and Doves, Heart of Roses, Congratulations; BOY'S Stuff -- Scarecrow, Checkmate, Barbershop Quartet, Grandfather Clock; CHILDREN'S CARDS -- Carousel with Baby Toys, Clown, Hickory Dickory Dock, Little Miss Muffet; CHIRSTMAS CARDS -- Merry Christmas, Christmas Greetings, Scroll and Candle, A Child Is Born; SPECIAL PROJECTS -- Christmas Earrings, Christmas Tree, Angel Dedoration, Gold Trinket Box. Address sticker on front cover, Notes by some patterns, some spine wear. 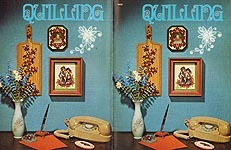 Gallery of Quilling, by Malinda Johnston, Designs by Malinda, 1974. Designs include: Clipper Ship, Garden Bounty (Vegetables, English Peas, Green Onions, Carrots, Corn), Strawberry Plant, Seagull's Flight, Circus Time (Bimbo the Clown, Snoopy the Seal, Jumbo the Elephant), Rocky Mountain Wildflowers (Parry Primrose, Chiming Bells, Indian Paintbrush, Snowball Saxifrage), Cluster of Grapes, Woodland Trio (Mouse, Mushrooms, Turtle), Christmas Magic (Wreath, Christmas Tree, Snowman, Candle), Seasonal Decorations (St. Patrick's Day, Easter Basket, Valentine Heart). Very good condition.